Since February 2013 the A&O Kln Dom presents itself in a new light! With new, yellow exterior color we give our guests a warm welcome. Arrive in the spacious lobby area and check in at the front desk. After the renovation, each of the 44 rooms now offers modern bathrooms with shower/toilet in a familiar, high-quality A&O standard. The newly designed breakfast room with the Cologne look and free Wi-Fi on the ground floor now invites guests even more to taste the all-you-can-eat breakfast buffet. The A&O Kln Dom is very central. It's only 100 meters to the Central Station and the Cologne Cathedral. 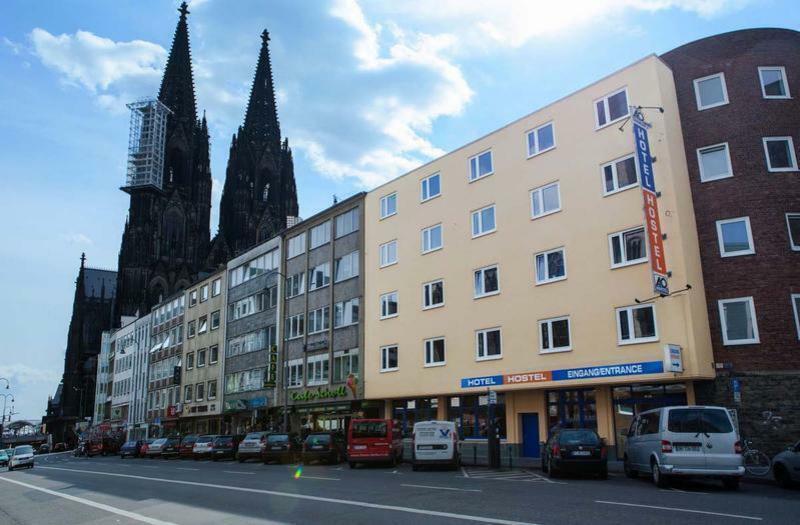 The Cologne Altstadt is just 300 meters from the hostel. With its central location the A&O is easy to reach by car, train or bus, and is the ideal starting point for excursions into the city. In the small A&O Kln Dom you'll experience the cheerful Cologne spirit and have an inexpensive and central spot from which to discover the Ruhr capital. 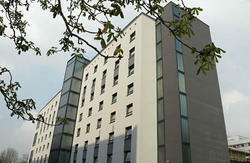 Due to its central location right in the middle of the city centre you can admire the numerous sights. The excellent transportation connections also make it just a short distance to the trade fair grounds. 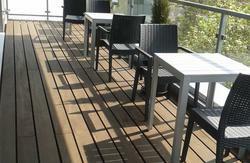 The Hotel is just some hundred meters from Cologne main station. From there walk towards the cathedral. Leave the cathedral and the Cologne Tourism Office to your left and walk into Komdienstrase. The Hotel is on your right. From central station (ca. 100m): There you take the exit 'Dom'. Cross the square to the Trankgasse and turn right. Follow the street until you reach Komdienstrae. After 70 m you can see the hotel on the right. The ZOB Main Bus Station is on Johannisstrasse. Walk south to Kostgasse, then keep right on Trankgasse. Walk straight until you reach Komdienstrasse where you will find the Hotel on your left. From the airport: Take the S13 direction Horrem to Kln Hbf. There you take the exit Dom. Walk over the square to Trankgasse and turn right. Follow the street until you reach Komdienstrae. After app. 70 m you can see the hotel on the right. From North: Leave the A57 at the exit Zentrum and turn left into Subbelrather Strae. After approx. 150 m keep to the right at Glasbacher Strae. Always straight ahead to Christophstrae, Gereonstrae and Brsenplatz. At Tunisstrae turn right, after 120 m again left to Burgmauer. Drive further to the Komdienstrae and the hotel is on the right. From South: Leave the A4 at the exit Kln Klettenberg. Head towards the city along Luxemburger Strae and Weyerstrae, at the forking keep to the left. After 200 m keep to the left again to stay on Blaubach. At Neuklnstrae turn left, at Tunisstrae keep to the right. Then turn right to Komdienstrae. The hotel is on the right side. From West: Leave the A4 direction Kln at the exit 11-Kln-Kleppenburg to the B265. Head towards Klettenburg/Kln-Zentrum-Hrth. At the forking keep to the right, follow signs to Kln-Klettenburg/B265 and take Luxemburgerstr./B265. Drive further along Weyerstr., at the forking keep to the left. After 200 m keep to the left again to stay on Blaubach. At Neuklnstrae turn left, at Tunisstrae keep to the right. Then turn right to Komdienstrae. The hotel is on the right side. From East: Take the A4 direction Kln. Further on the B55 (signs to Kln Zentrum/Kln Deutz). Pay attention to the exit Kln Zentrum. At the Niederlnder Ufer/B51 turn right and stay on the B51. After a couple of meters keep to the right at Konrad-Adenauer-Ufer. At Trankgasse turn right again, keep to the right at the forking and drive on Komdienstrae. The hotel is on the left side.